A friend of mine tells me he likes picking up broken seashells more than whole shells. He is a preacher so maybe it's a manifestation of some quirky worldview. And maybe not. He says he just finds the broken shapes more interesting, more fascinating, more captivating. I don't generally share my friend's enthusiasm for broken shells, but every once in a while I spy a particularly interesting one. A while ago I came across a large horse conch that had been beaten and battered by the surf. Most of the outer shell was broken away, exposing the intricate, spiral swirls down the center. I picked it up, and it rests on the table on my screened in porch. I like it, but I'd like an unbroken horse conch even more. There are generally two primary reasons people give for choosing to call Ocracoke home -- family & community.....and natural beauty. I talk a lot about the former. The latter is almost as important, and likely more obvious to the infrequent visitor. As most of our readers know, our beach is outstanding -- 16 miles of undeveloped shoreline is almost unheard of nowadays. Of course we have fantastic fishing (both inshore and offshore), recreational boating, sailing, & kayaking, as well as clamming, crabbing, and surfing. We have spectacular sunsets, and inspiring sunrises. Our island is literally shaped by nature. Wind and tide are constantly recreating this unique place. As I walk out by the sound shore, or even in the village I am often struck by the sight of twisted, gnarled limbs of centuries old oaks and more recent cedars. They tell their own silent stories of years of molding by the powerful forces of nature. We are relative newcomers, visitors if you will, privileged simply to be here now to soak in the power and beauty of nature and this fragile sandbar. On the island, being invited out to dinner is most often like being asked by family to come over for a meal. No need to dress up (bare feet are always acceptable) or fret about what time to arrive. It's even OK to go early. That way you can visit, watch the kids, or even help with the preparation. But the informality doesn't mean the evening lacks interest. Quite the opposite. Last night I enjoyed such a dinner with friends. We sat at the kitchen table (come to think of it, I don't believe they have a dining room table), feasted on Bourbon Pecan Chicken (served alongside their son's Lego creation), enjoyed a beer or two, and chatted about Life, Philosophy, Science, & Religion. Oh yes, we told jokes, laughed (a lot), and even played some guitar (well, I listened). The song was a tongue in cheek creation about Werner Heisenberg's Uncertainty Principle, and Niels Bohr's Complimentary Principle. All told it was a splendid evening of good food and good fun. I can't believe there are no more poets out there in our reading audience. But, alas, I've received only this one submission in response to my call for verse. Thank you, Clem! But we're workin' on it. In the buzzing blaze of midday. We sit here in the heat. We feel in our own hot blood why their flailing's torpid. Heats up and slows down in these parts come July. (measure by tides, stars or phases of the moon). We still think about the day's schedule, don't we? What must we get at the store? What shall we make for supper? Do we have time to go to the beach? When (why?) do we have to go home? Nope. We're not quite O'Cockers yet. But it’s workin' on us. On Thursday, native & long time Ocracoke resident, Nathaniel Jackson, was laid to rest on the island. Nathaniel had spent a number of his younger years working as a fisherman and crabber. Later on he turned to carpentry. In the 1970s & 1980s Nathaniel purchased a back hoe and other heavy equipment, and began installing septic systems. He also looked after rental properties for off-island owners before realtors became established on Ocracoke. Many long-time visitors to the island will remember Nathaniel and his delight in sharing island stories. He embraced everyone, from native islanders to new residents to first time visitors. It was as if Nathaniel had never met a stranger. Although he suffered from numerous health problems in his last few years, Nathaniel never lost his quirky personality or his sense of humor. We all will miss another of our "old-time O'cockers." Some of our readers may want to share their stories of Nathaniel. I believe that anyone who ever met Nathaniel has at least one good story to tell. Just click on the "comments" link below. Wednesday night at the monthly meeting of the Ocracoke Civic & Business Association the members heard about a number of issues affecting the island in coming months. Reports were given on new sidewalks that will be laid alongside NC Highway 12 in the heart of the village, additional parking that is planned for the lighthouse, a bike path that will be constucted (first to the campground, then to the pony pen, and eventually all the way to Hatteras Inlet), a tram that will help ease traffic congestion in the village, and the replacement of the seven bridges on Highway 12. We also heard reports on coming changes to the OCBA website (http://www.ocracokevillage.com/ocba.html), plans for our July 4 celebration, & the status of the Graveyard of the Atlantic Museum in Hatteras. Although committees and task forces have been working on these issues for some time, implementation of the projects has not actually begun. Keep posted right here for more information as it becomes available. Yesterday a reader asked about the latest news re. the Community Store. As many of our readers know, the Community Store was opened in 1918 and remained a focus of the community until the spring of last year when they closed their doors. Rob Temple & Sundae Horn have been interested in reopening the store, but a number of issues prevented that from happening. The good news is that a group of concerned residents have been working together this winter to get the store back in operation. The details are sometimes complex, but I will share the general idea. The goal is to operate as a general store/grocery store/cooperative under the care of a non-profit corporation. Committees have been formed and they are pursuing funding as I write. At this time everything looks like "a go." Although everyone involved was hoping for an opening before Easter, it now seems unlikely that the store could open before June. When the store does reopen it will operate as a general store with a full stock of basic groceries, as well as specialty items. It will be open to the public, as before. In addition, there will probably be opportunities to join a Community Store co-op. Membership might entitle members to certain discounts or the chance to purchase some items in bulk. These details have yet to be worked out. I had been waiting until the funding was secured and a definite opening date was announced, before writing again about the Community Store. However, the question prompted me to revisit this topic again now. Keep reading the journal. As soon as more information is available I will let you know. It may have been sunny...and a little warmer, too....but it sure was windy yesterday on the beach. The wind was kicking up the waves, and that brought out the surfers. Donned in wet suits, their boards waxed up, they paddled out to catch the good ones. I walked on, into the wind, trying to keep from getting chilled. The return hike was more pleasant, with the wind at my back. At home again I sat on my steps to take off my shoes and empty out the sand that had found its way between the seams. It is calm today, but overcast. I believe we might see some rain this afternoon. This is just one of those days -- emails to answer, trash to haul to the dump, laundry to wash, papers to organize..... In many ways living on Ocracoke is just like living anywhere else, I guess. It's difficult to ignore life's little details. However, the weather has turned delightful this morning. Bright sunny skies and temperatures in the mid-50s will entice some of us to the beach later today. I suppose living on Ocracoke is a tad different from most other places. Oh yes, one historical note. On this date in 1928 one of the last shipwrecks (not counting losses during World War II) to occur on our beaches was recorded. The four-masted schooner, George W. Truitt, Jr., laden with 645,000 feet of lumber, with a crew of seven "went ashore...in a 40 mile an hour gale from the southwest." All of the crew members were brought ashore in the breeches buoy. Village Craftsmen has been open for three days now, so we all agree that it's time for a day off. Although it has been cold and windy this morning, the breeze is calming down some and the bright sun is beckoning me outside. Lachlan has been asking to make another foray down to Springer's Point, so we'll bundle up and go exploring. Maybe we'll find another Native American pipe bowl along the shoreline like I did thirty years ago. If not, we'll still have a great adventure. Some days ago a reader left this comment on one of our journal posts: "Your entry about the unique obligations of island residents called to jury duty sparked a question in my mind about how you folks deal with another everyday part of life -- death. I don't recall seeing any funeral homes on the island in my many visits there. I certainly don't mean to be insensitive, but what's the standard procedure on Ocracoke for dealing with this inevitable part of life?" In reply I have devoted our February Newsletter to answering this question. You can read the newsletter here. Today at noon the local chapter of the Ocracoke Masonic Lodge held a benefit pig pickin' at their new cook shack. The members had secured three pigs, and served the barbecue with baked beans and coleslaw, as well as rolls and soft drinks. The ladys of the island Needle and Thread Guild (the "Quilters") baked brownies, cookies, cup cakes, & cheese cake to go along with the hot meal. All this was to raise money for the family of Brad Gaskins, a local young man who died unexpectedly several weeks ago in his mid-30s. The Masons donated their time and the ingredients. And the meals were offered for a "donation" of any size. All proceeds will go to Brad's family. I guess this is just what folks do in a small, tight-knit community. We look after one another. Thanks to all the volunteers who contributed so much for our neighbors. It is sunny and breezy this morning. Even though it is barely above freezing I'm thinking it would be a great day for a walk on the beach. We'll see. Coming up is a long weekend in honor of presidents Washington & Lincoln. Of course that means a few visitors will find their way to the island. Forecasters are calling for warmer weather in the next few days. This is typically when we open Village Craftsmen for the year and 2007 is no exception. Beginning today we are open five days a week (Wed. - Sun., 10 am - 5 pm). Today is also the anniversary of two notable Ocracoke shipwrecks, the Lambert Tree in 1841, and the A.F. Crockett in 1885. To read about the wreck of the Crockett click here: http://www.villagecraftsmen.com/news021806.htm. A week or so ago a reader asked about death & dying on Ocracoke. I didn't post a reply to the question (I suppose I just got distracted -- I'll blame it on Lachlan! ), but I have been using that question as the catalyst for my next monthly newsletter. I am working on that article right now and will be ready to upload it in a week or less. So be looking for the link in an upcoming journal entry. Yesterday a reader alerted me to the poems of Pablo Neruda. I have to admit that I'm not so knowledgeable about literary matters. But I did a Google search and came up with a host of wonderful poems. You might want to do the same. Were I a poet I might attempt to convey some of the magic of Ocracoke in verse here in this journal. Come to think of it, if you are a poet you are encouraged to use the comment option below to post some of your very own poems, especially if they pertain to the island. I might even copy and paste them into a future journal entry. I awoke this morning to gray, overcast skies. The cedars outside my bedroom window were swaying in the fifteen mile per hour wind, beckoning me out of bed and inviting me to step outside to feel the cool breeze. The temperature is dropping again today, after a brief hiatus. Yesterday was t-shirt weather, and Lachlan and I took an hour after lunch to run and play on the beach. Eventually a light rain drove us back to the shelter of the car. All of us love this time of year when the pace of island life is especially slow and relaxed. Our work schedules are flexible and we take more time to visit and talk. Last night Amy, David, Lachlan & I shared a dinner of chili and homemade bread. Afterwards we spread out and played a couple of games of cribbage on my living room floor (Lachlan entertained himself with jigsaw puzzles). With warmer days yesterday and today we see a few more people outside. Mothers pushing baby strollers, carpenters on roofs, neighbors trimming bushes or neatening up their yards. The weather is still not right for painting fences and such -- forecasters are calling for cold temperatures again later in the week -- but the daffodils are in bloom. So we'll just continue enjoying the peace and quiet of an island winter. It is nearly 60 degrees this morning. After almost two weeks of cold weather (for us islanders it's cold when it drops below freezing overnight) folks are out and about today in shirtsleeves and t-shirts. It's the perfect day to get some outdoor chores accomplished. The sun is bright and it feels like spring is around the corner. Today, of course, is Abraham Lincoln's birthday. So Happy Birthday, Abe! Happy Birthday to Charles Darwin, also (both he and Lincoln were born on this date in 1809), and to any of our readers who are celebrating a birthday today. We believe that Ocracoke had, for a number of years, the country's smallest library. It was an 8' x 10' wood frame building behind the Fire House. It contained about 3,000 books and was operated for twenty years by librarian Marguerite Boos. It closed in 1996 and was moved to the property of Karen Lovejoy & David Frum to be used as a home schoolhouse. In the same year the new Ocracoke School and Community Library was opened next door to the Fire House. At your next opportunity be sure to stop by the library and peruse the book selection. They also have a fascinating local history section of old newspapers, scrapbooks, and photographs with rare glimpses into island life of bygone years. Of course, the library has Internet access also. The ocean was calm again yesterday afternoon. Miniature waves rolled up on the beach, but they were sharp & clean. I imagined tiny little surfers in Ken & Barbie sized wet suits having a grand time catching waves. And beyond the little breakers I saw dolphins. At first just one or two. Then groupings. It's difficult to count dolphins. Two or three will surface, then dive. Others rise up behind or beyond them. Are there a half dozen in that pod? Or maybe a dozen or more? Some were heading south; others were swimming north. Now and then one (more than likely a youngster, I'm supposing) would jump and twist, then dive back with a splash. All told I saw dozens of dolphins in a number of pods. So don't be concerned. In spite of my post a couple of days ago, there seems to be no shortage of dolphins off our shore. At the fork in the path he pointed to the right. After a few steps he turned around and headed off to the left. He stopped to examine pine cones, leaves, and roots. Sometimes we'd retrace our steps for no apparent reason. Every side path was a new adventure. Finally at the sound we halted for a few minutes to gaze out over the marsh and the water. I tried to explain why we weren't going to traipse through the tall marsh grass. We looked for birds. On the way back we stopped to pick "blueberries" and stuff them in a side pocket. One stick became a horse and we galloped down the path. Another stick was a fishing pole to take "to the lake." On one boardwalk we stopped to bounce up and down, as if on a small trampoline. Along the way we examined cedars, live oaks, and pines. He's noticing the difference. On other walks we've seen snakes, nutria, geese, and herons. I suppose it was too cold and sunny yesterday. We just had each other for company. But a morning walk on the nature trail with Lachlan is always a delight. I gazed out over the water yesterday afternoon. Only low languid waves nudged the wide sandy beach. Mostly the surface of the water was smooth and calm. What a perfect day for swimming, actually swimming in the ocean, I thought. If only it wasn't so cold. With temperatures hovering right around freezing all day I decided it was prudent just to walk and enjoy the sunshine. For the better part of an hour I walked....and looked out toward the horizon. Normally, on a calm wintry day it is unusual not to see dolphins breaking the surface just beyond the breakers. But yesterday none were to be seen. I have no reason to suspect anything dire. But it was curious. Last evening David told me that at least one person saw dolphins off shore yesterday. I suppose I'll just have to go back out there later today and have a look one more time. About fifteen Ocracokers boarded the 6:30 a.m. Swan Quarter ferry yesterday morning on our way to jury duty. Some folks caught a bit more sleep in their cars, but most gathered in small groups in the passenger lounge to sip coffee, chat, or share a laugh or two. By 9:30 we joined dozens of other people from the mainland in the Fire Hall (the courthouse was damaged beyond repair in a recent hurricane, and the new building is not yet complete). We shivered in the cold concrete building as nine grand jurors were selected (four from Ocracoke). Four cases were scheduled this week, but the judge asked the remaining jurors to step out of the room "for about twenty minutes" while he conferred with the lawyers. The only place for us to go was the main bay of the Fire Hall. We sat on coiled up fire hoses, leaned against boxes and crates, settled down on the back of the firetrucks, or stood in the hallway. Twenty minutes turned into an hour....then two hours. Finally, after two and a half hours (by then it was after 1 o'clock) we were called back into the "courtroom." After a brief apology, and an explanation of how the "system" had "worked" in spite of our frustration, he told us that all four cases had been resolved "administratively," that our service was complete, and we were free to leave. Of course it was two and a half hours before the next ferry back home (and a two and a half hour ferry ride), or a 150 mile drive back to Ocracoke through Whalebone Junction & Hatteras Island. I elected to "drive around" since I had a few errands to run. If you don't live on the island take a moment to imagine having jury duty in some distant town either five hours from your home, or at least a 150 mile drive away (plus a 45 minute ferry ride and a wait in line for up to another hour at Hatteras Inlet). But then remember that we all think it's worth it just to live on Ocracoke. It's only five minutes to the beach, after all. Many readers have heard me comment on Ocracokers and jury duty. Well, this week is my week. I will be leaving on the 6:30 a.m. ferry to Swan Quarter on Monday (thoughtfully, the state waives the fee for those called to jury duty). There's usually a contingent of a dozen or so islanders called at one time. We chat on the way over, or play cards, or nap. We'll get to the court house by 9:30 to be sworn in (I always "affirm" -- it seems to me that my word is sufficient testimony to my intentions to do my duty faitfully). Mostly it's sit and wait, but some of us are always called to serve on a particular jury. If I am picked I may be traveling to Swan Quarter every day for a week. On the other hand, perhaps I'll be dismissed in a day or two. Most folks ride the 4:00 pm ferry home in the evening. On Monday I may "drive around" through Nags Head so I can stop and buy a new water heater (we islanders are good at "killing two birds with one stone"). The last time I was on jury duty the state paid $12.00 a day for our services. Given our distance from the court it amounts to about $1.00 an hour, but everyone I speak with is generally happy to do his or her civic duty. Not many days ago Melissa, clerk at our island Post Office, noticed that an elderly woman who had moved to the island, but whose husband had died some months ago, and who now lived alone, hadn't been into the Post Office to pick up her mail for the second day in a row. Concerned because of this uncharacteristic absence, Melissa decided to ask a neighbor to check in on her. The neighbor reported back that the woman had not responded to knocking on her door. Alarmed, Melissa asked one of our deputies to investigate. The woman had fallen and was unable to get up. Several days without food and water, and unusually cold weather added to her plight. She was rushed to the hospital, and although she is now in a rehab unit, she is doing better. Many thanks to Melissa who, like so many islanders, is aware of her neighbors and always willing to do what she can to look after them when they need it. This is one more reason that we all like calling Ocracoke home. 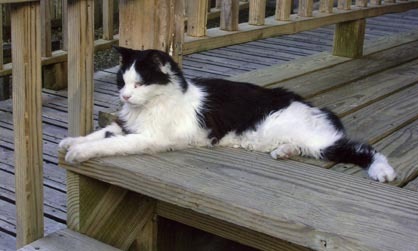 Many of our readers will remember Leon, the large, loveable Manx cat who greeted folks at Village Craftsmen for many years. Leon died one year ago today, after struggling with a number of health issues. Needless to say we all miss him. Just an update this morning. Several days ago I mentioned Muzel Bryant, our island's oldest resident. Muze, who will turn 103 on March 12 had apparently been wondering why I hadn't been by to visit lately. I pleaded a series of hefty colds, and two trips to see Lou Ann. But this past Sunday I called Amy, and the two of us strolled over to see Muze. Muze didn't think she'd have a big birthday party this year. Three years ago the community turned out for a dinner on her one hundredth birthday. Afterwards Muze led the way out to the Pub for a party. I'm embarrassed to report that I left at 11:00, about two hours before Muze headed home! You can read about her 2004 party here.